But the letters are not the real reason for Tristan’s visit. He can no longer keep a secret and has finally found the courage to unburden himself of it. As Tristan recounts the horrific details of what to him became a senseless war, he also speaks of his friendship with Will–from their first meeting on the training grounds at Aldershot to their farewell in the trenches of northern France. When Tristan first enters the Cantwell Inn, Mrs. Cantwell’s son, David, presents the question of morality and describes the incident that happens in room four as “a personal indiscretion”. 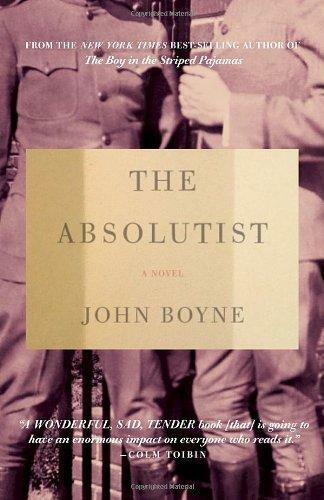 Which characters does Boyne present as judges of morality in The Absolutist? How does Tristan’s complete avoidance of their judgments define his character both negatively and positively? In solitary confinement, Will makes it clear to Tristan what he dislikes about him and what makes them different. Tristan’s silent compliance with the injustice of the military system and his insistence that their intimate moments hold some greater meaning come to repulse Will. Yet when Will removes his blindfold, his reaction suggests a kind of heartbreak. How do you read Will’s reaction? Do you find any similarities between the two men? In the novel’s carefully crafted structure, relationships and events build upon one another to culminate in an emotionally complex ending. What implications can we draw from Tristan’s description of his father as a butcher with “the boning knives, the animal carcasses, the bone saws and rib pullers, the bloodstained overalls” (p. 35)? What parallels are being made and how do they help us understand Tristan’s relationship with his father and with violence? Can you think of other symbolic comparisons? Tristan’s internal conflicts with his family, with Marian, and with Will build in suspense. By not directly identifying Tristan’s sexual orientation until later in the novel, Boyne allows room for a larger question of identity to develop. Consider Marian’s position within her family and her community, David’s ignorant desire to join the military, and Sergeant Clayton’s development into a war fiend. How do these individual situations broaden Boyne’s theme of troubled self-identity? Which other characters, struggle with their identity, and in what ways? Tristan shows a particularly insightful ability to read a person’s expressions (i.e., “‘I do apologize, Mr. Sadler,’ [David] said, turning to me now with a complicit smile, as if to imply that he and I were of a type who understood that nothing would go right in the world if we did not take it out of the hands of women and look after it ourselves” [p. 7]). Does Tristan’s heightened intuition and sensitivity to other characters redeem his tendency to avoid conflict? What other redeeming characteristics does Tristan possess? Tristan confides to Marian that he never took another lover after Will. This choice does not seem to be solely out of respect for the love he had for Will. Why else might Tristan insist on spending his remaining days alone? In old age, Tristan reveals his plan to commit suicide and leave behind the story he has just told, accepting that this will ruin his reputation and cause him to be considered the greatest feather man of them all. How do you interpret Boyne’s final treatment of Tristan’s cowardice and self-image? Tristan joins the firing squad on an angry impulse. Later he admits to Marian that he helped murder Will because he couldn’t have him. Considering Will’s reasons for being disappointed in Tristan, what is the irony of Tristan’s action? What is implied when Tristan’s own death approaches?